After yesterday's bonanza of cooking and pickling the kitchen was left in a state that most closely resembles the lair of one of those mad scientist guys in a post-apocalyptic movie. The only thing missing is a guy with a dirty trench coat on and goggles made out of copper. Oh, and a flying machine that, after the protagonist boards with him, he reveals has never actually tested before just as they roll off the edge of a dusty plateau. Hollywood producers: call me if you want to take a look at my script. I was going to make a great big kale salad to get started, however, when I looked in the salad spinner I saw that we only had enough kale to make what a mouse would consider a great big kale salad. A mouse who had snacked before diner. And had had gastric bypass surgery. 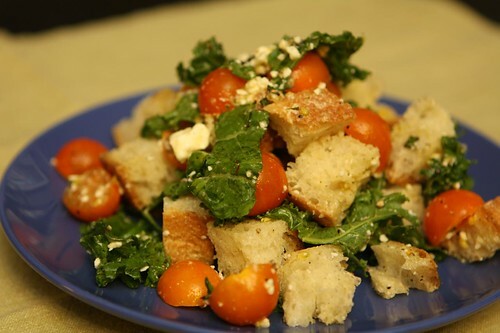 Instead I decided to cube up some bread and toss it with the kale. I added a squeeze of lemon, feta, chopped basil, Sun Gold cherry tomatoes, olive oil, salt, and pepper. As a super special twist I also drizzled a little honey onto the salad. 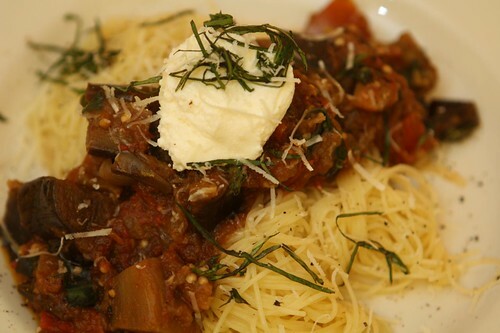 Tonight, based on all the ingredients this week, I decided to make pasta that had a caponata-style sauce. I browned some garlic, tossed in some Wala Wala onion, the farm eggplant, and some of the tomatoes. After stewing for a while I threw in some of the basil leaves and a splash of balsamic. There are a great deal of things I could have added to this sauce to make it like a caponata. One thing I would have added is pine nuts, however, I have decided that I am now boycotting pine nuts. I really like pine nuts but they have reached an absurd price. With cashews being such a cheap (and, frankly, just as delicious) alternative I don't think I can justify their use in cooking anymore. 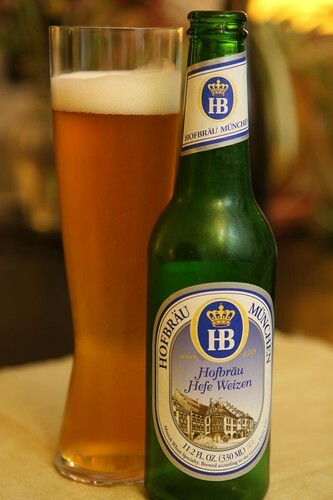 So it is that I bid adieu to pine nuts. It's been nice knowing you but until you get down off of your expensively priced horse I'm going to have to go with your tastier and more affordable cousins. Also, in the post-apocalyptic future, pine nuts are more precious than gold. For dessert I recreated a snack that Jen has been making for the past few days. The snack she invented was putting some Speculoos spread on a graham cracker then topping it with fresh peach slices. 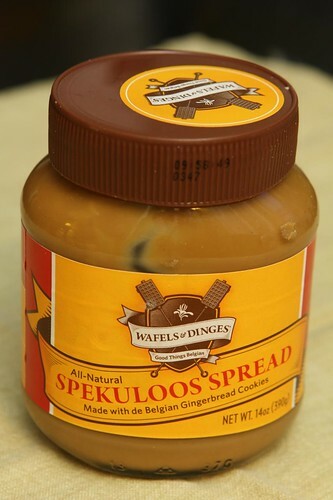 Speculoos spread is a spread made out of ground up Speculoos cookies. I liked the cookies so much on our trip to Europe that Jen brought the spread for me. You know a spread made out of cookies goes great on? More cookies. True story. I mixed together some Speculoos spread with a little melted butter and crushed up graham crackers to use as a crust in a small casserole dish. 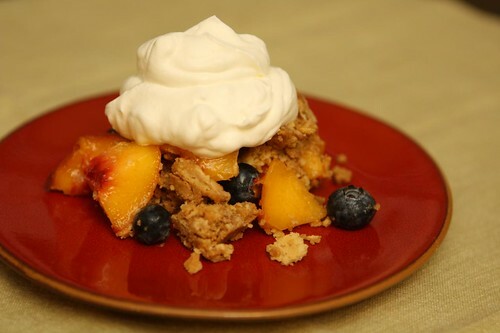 I topped the mixture with peaches and blueberries and chilled it until it was cool enough to slice and serve in little squares. It is convenient that Jen's fantastic idea comes at this time seeing how we have a bunch of expired graham crackers in the cupboard that need to be used up toute suite. I cut out a square of the dessert, which ended turning into a pile, and topped it with whipped cream. I've been steadily cutting back on the sugar I add to my whipped cream and now I've reached a point where there is no sugar and only vanilla. The dessert was plenty sweet enough without the additional sugar. Expect a large number of bakeless graham cracker crusted desserts to follow. It's going to be like recipes on the back of a graham cracker box in the 1980's. In this post-apocalyptic wasteland we're lucky when we can get any kind of crackers, stale or otherwise.